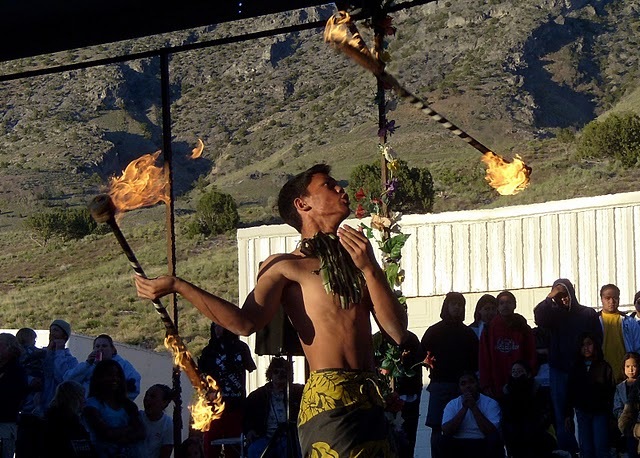 Believe it or not, prehistoric Utah was a tropical place covered mostly by shallow seas. The limestone bands on these hills were reefs on which huge populations of these invertebrate creatures lived and died. The fossils are those of organisms that were covered with sediment shortly after death and were subsequently locked in the rock’s matrix. From the top of the archipelego: Stepped hills curve outward. The limestone bands are prehistoric coral reefs. The following originally appeared in the March 4, 2010 edition of the Tooele Transcript Bulletin. It was high noon when I crested the unnamed desert ridge and gazed toward the thin strip of blue to the east. Strangely, the Great Salt Lake looked small from my vantage point—and much further away than Google Maps was telling me it really was. Curious too was the sense of prominence of this low summit. The vista to the southwest boasted every element of a perfect computer desktop wallpaper—the expansive Puddle Valley against a distant Cedar Mountains backdrop, the geometry of cascading step pyramid hills that diminished as they curved outward to form a photogenic archipelago. Looking down, I noticed that the limestone outcropping I stood on was peppered with fossilized horn coral, relics from this place’s pre-desert days. I’ve written about fossils further south in the Lakeside Mountains, but these were a pleasant surprise—a satisfying reward for finally revisiting Tooele County’s Great Wide North. Last weekend’s trip was inspired by a flight I took to Reno a few days prior. I spent the short flight studying the terrain below from my north side window seat. While I can usually recognize most of the topography south of I-80 from above, the landscape north of the highway between the Great Salt Lake and the Bonneville Salt Flats had me stumped. Clearly I had neglected this region in my travels, and it was time to make things right. So when I got back I loaded the boys up and we headed out. Our destination: Puddle Valley and the Lakeside Mountains. The Lakeside Range and other minor ranges in the area are replete with unique vistas, old mining camps and interesting geologic formations. A person with extra gas containers and a good supply of Gatorade could spend weeks exploring everything out there. I didn’t have weeks, so before we left I consulted the forums at Expedition Utah, an online community where desert rats like me, but with better four wheel drive vehicles than mine, gather to plan overland treks and shoot the breeze about roads less traveled. 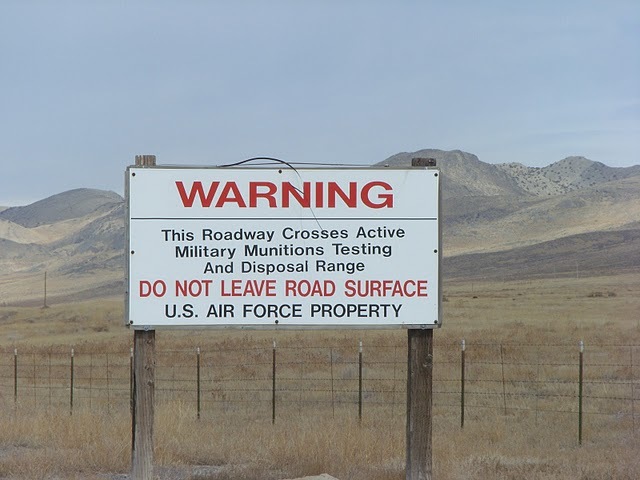 Curt Hall, one of the site’s curators, suggested we explore the Delle area and make our way to the public road leading to the Air Force managed Utah Test and Training Range (UTTR)—a loose itinerary, and a liberating one. When it comes to desert preparedness, overplanning is essential. Itinerary-wise, not so much. Too often, the desert’s finer corners are missed in the rush to make a prescribed destination. My only prescribed destination was the “Monster Eyes” at the Delle exit. If you’ve ever driven past Skull Valley, you know what I’m talking about—the twin caves in the hillside that bear a disturbing resemblance to eye sockets. 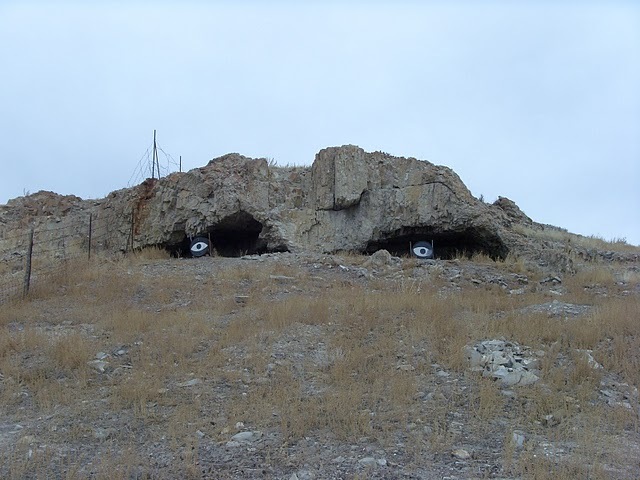 Some clever prankster has taken the time to paint eyeballs on drum lids and secure them in the caves so that westbound travelers are met with a monstrous glare. I always wondered whether they were really shooting targets. 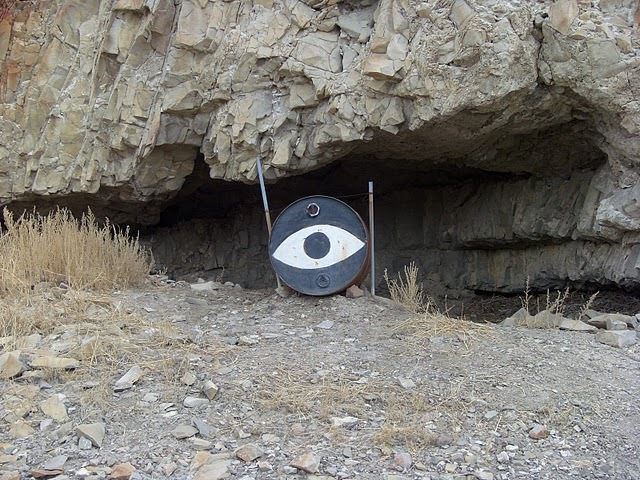 As it turns out, those eyeballs may be the only man-made items in Skull Valley not riddled with bullet holes. We caught the Puddle Valley Highway at the next exit and three pronghorn antelope stood clear as we and followed it north along the western flanks of the Lakesides. Puddle Valley derives its name from its clay floor and lack of drainage. Roads are often impassably muddy during the wet months. They solidify nicely when they dry up. Looking for a good dirt road to turn off on, I fired up my phone’s GPS and watched my little blue dot move across the satellite image as I drove. The boys, whose Nintendo DS’s I had confiscated back home so they could enjoy the drive like real people, were quick to point out my double standard. They were itching to get out for a hike, so we turned off on the road leading over Wrathall Pass and forked off toward a chain of fin-like hills that give rise to the 5,830 foot Jedediah Mountain. We parked at the northern end of the curving archipelago and hiked to the ridge. 8 year old Bridger led the way with 6 year old Weston close at hand. 4 year old Coulter hung back, unloading imaginary bullets into ant hills with his toy gun. Two large birds of prey flew separate routes above the pass while the occasional vehicle rolled by silently below. Around the bend and up Monarch canyon would be the Monarch Mine, which was abandoned in the 1940’s and has hardly been touched since. So far, the Monarch and the nearby Silver Queen have been spared reclamation by the BLM, thanks mostly to the protests of Gold Rush Expeditions, an organization dedicated to the preservation of historic mines and ghost towns. We steered clear of the mines and stuck to the fossil-laden limestone outcroppings on the ridge. 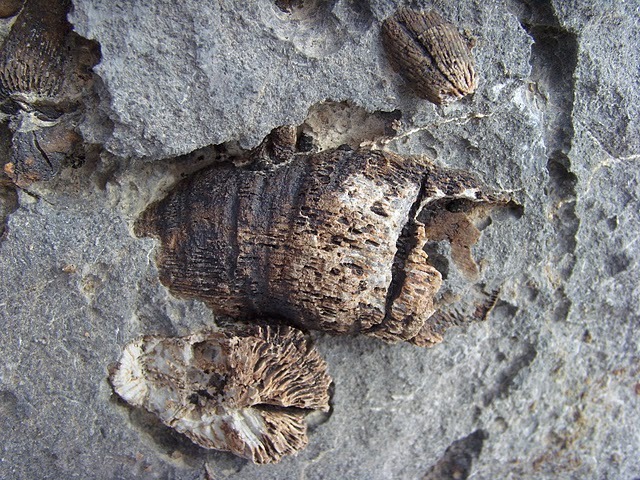 The Lakesides are a hot spot for invertebrate fossils like crinoids, bi-valve seashells, and horn coral that date past Lake Bonneville to roughly to the Mississippian Period 350 million years ago, before the land that would one day be Utah rolled to its current position on the globe. The fossils seem out of place in this now inert no-man’s land where clay and sagebrush rule. The range’s sun-washed ridges and the and petrified coral were pleasant reminders that life’s more interesting things are often found along unnamed dirt roads and on limestone walls. The Lakeside Mountains are accessible via the Delle and Lakeside I-80 exits. Most area roads are dirt and pass through BLM and State lands. Though many roads are passable by car during dry months, high-clearance or 4WD vehicles are recommended. Small amounts of loose fossils can be collected on BLM lands. Fossilized coral in Utah??? Yep, horn coral. And shellfish. Loads of them. 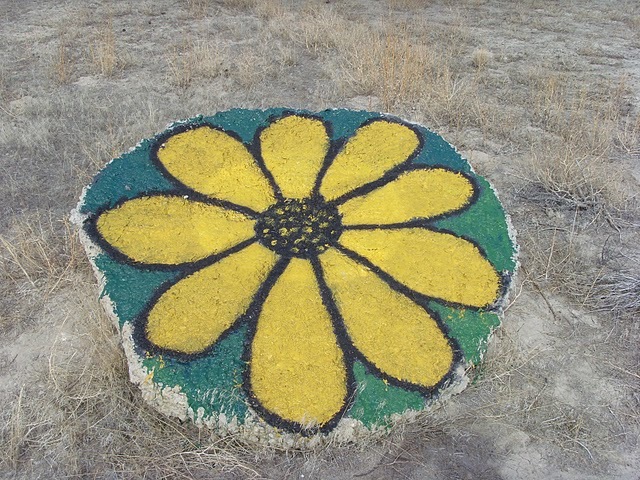 This rock sits near the entrance of the Air Force test range. I guess it's some sort of hippie expression. There’s meteorites in them there hills! The adventure began just after midnight on November 18 when a bolide meteor– possibly a stray from the Leonid shower– streaked through the night sky over Tooele County and sparked a public frenzy. The fireball, which was seen as far away as California, hit Earth’s atmosphere with such intensity that it had to be measured in terawatts. 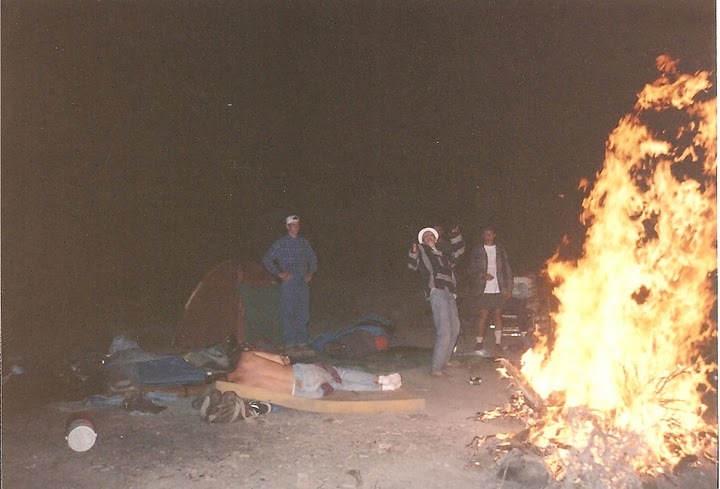 Those fortunate enough to witness the event were treated to the light show of their lifetimes. The above is a compilation of several clips from Salt Lake City area security cameras that captured the falling meteor. The following originally appeared in the December 3, 2009 edition of the Tooele Transcript Bulletin. Silky clouds crept over the Stansbury Mountains and began spilling rapidly into the range’s western canyons. An unrelenting wind tossed large tumbleweeds helplessly across Skull Valley. The scene might have been ripped straight from an epic western film– one with a major science fiction twist. 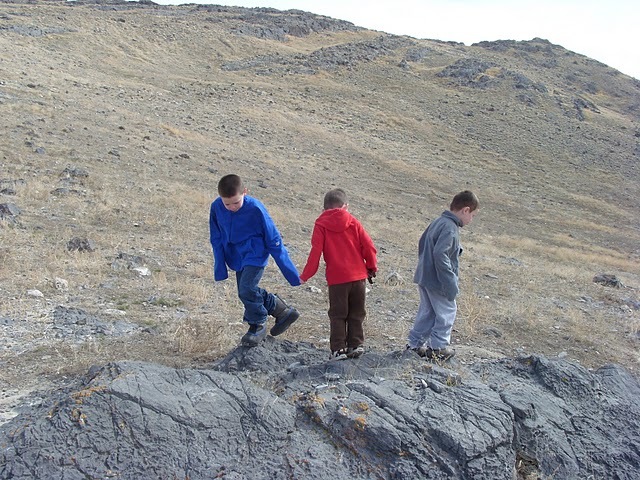 My sons Bridger (8) and Weston (7) and I marched along a bare stretch of terrain, our eyes trained on the ground, scanning every inch of dirt for remnants of another world. 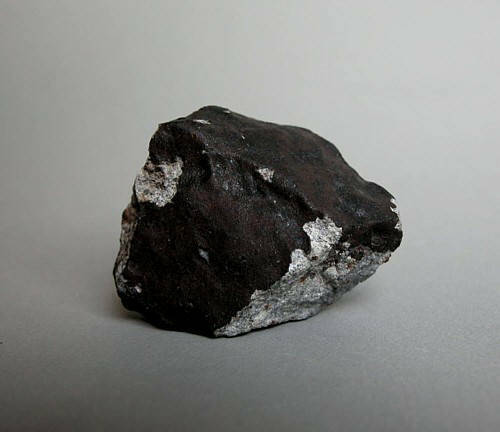 What would a meteorite look like? We didn’t know exactly. But the prospect of freshly fallen space rock was too appealing to pass up. Our method wasn’t scientific. Most of the technical legwork had already been completed by astronomers and devout meteorite hunters the country over. Tap that mass collaboration, I thought, and we just might have a shot. Regional seismograph stations recorded vibrations that seem to have been generated by the meteor’s sonic boom. 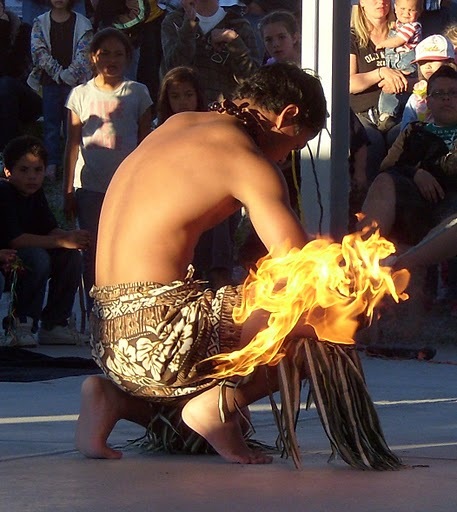 The event was captured by several Salt Lake area surveillance cameras. Footage was given to media outlets, who promptly broadcasted it and posted it online. Astronomers recognized the phenomenon and scrambled to calculate the details. Local experts estimated that the meteor exploded at about 20 kilometers above the earth’s surface and its fragments dispersed somewhere over western Utah. Like the fireball’s appearance, the response by meteorite hunting groups was both intense and brief. News of the “witnessed fall” quickly reached Mike Bandli, founder of Historic Meteorites, a private meteorite collecting and hunting organization based in Washington State. He immediately called his hunting partner, Rob Wesel, and told him to take some time off work. In the last year Bandli and Wesel have recovered meteorites from three separate falls and were ready to spend their Thanksgiving scouring Tooele County’s deserts. With the help of meteorite modeling expert Robert Matson, the team began to aggregate data. Step one was crowdsourceing. Bandli posted a request for eyewitness accounts in the comments section of a Salt Lake Tribune article about the event. The team then turned to the video footage. The flash lit up surrounding mountains, revealing the cameras’ angles in relation to them. And so the effort screeched to a halt. Fellow meteorite hunters that had been dispatched to Utah tried unsuccessfully to collect more information. Seismic data gave only an expansive area where the fireball occurred, and the fall failed to register any usable Doppler radar data. 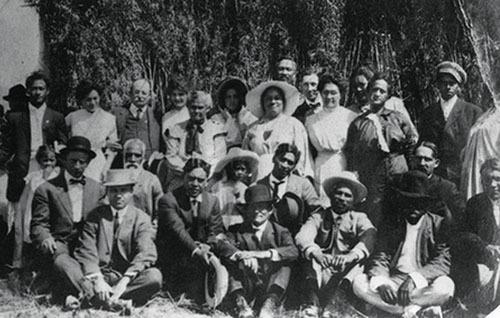 Bandli and Wesel, who were ready to fly into Salt Lake that day, contacted Dugway but were denied access. 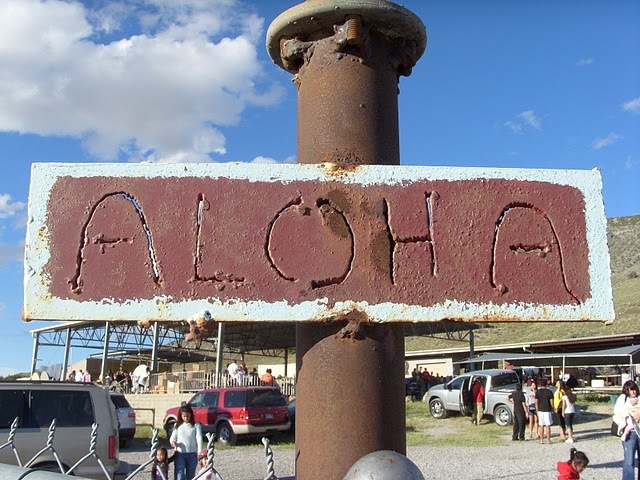 Dugway spokeswoman Paula Nicholson confirmed that some groups had contacted the facility to gain access but were denied. She said there’s no evidence yet that anything landed there, but promised to keep the public informed of any findings. I came across Bandli’s Tribune comment while parsing media reports. I contacted him and he was happy give me a peek at the complex world of meteorite hunting. Once the team identifies a portion of the strewn field, the hard science takes a back seat to simple visual analysis. 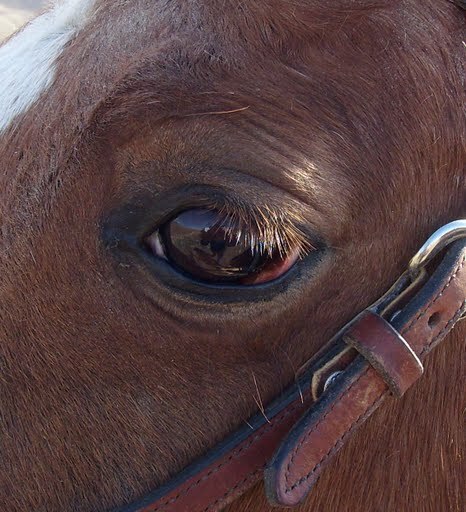 “We rely heavily on our eyes,” Bandli said. And instinct. Some hunters carry magnetized canes to probe the ground (most meteorites attract magnets), but experienced hunters like Bandli can identify meteorites visually. “They’re black, burned rocks that look out of place. In many cases they are chipped or broken revealing a bright or grayish interior,” he said. The team walks in a gridding pattern to accurately sample areas. When meteorites are discovered, they begin to map the strewn field. Smaller meteorite fragments lie toward the strewn field’s tail and grow in size toward its head. Finds are meticulously detailed to maximize their scientific value. But the meteorite hunting community may not be entirely out of luck. Bandli said some data suggests that fragments may have broken off of the meteor early and landed in rugged terrain immediately northeast of Dugway. Calculations proposed to Paula Nicholson by the Discovery Channel also place the strewn field northward.. Despite recent reports placing the termination point even further west, Bandli remains confident in his Dugway triangulation. 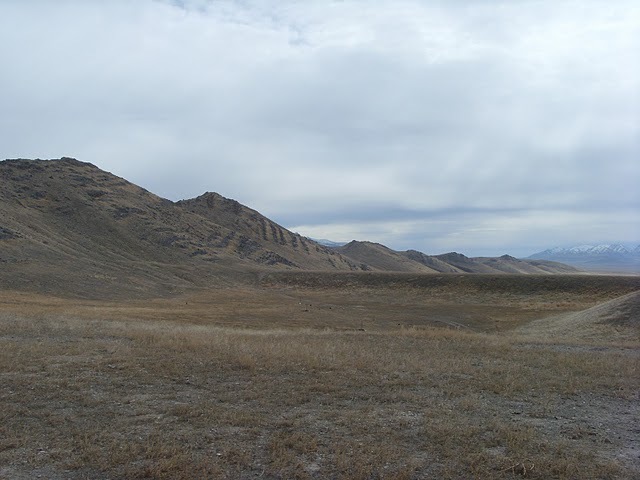 The boys and I had chosen a flat area on the flanks of the Cedar Mountains a safe distance north of the Proving Grounds. We walked a criss-cross pattern, finding a few rocks looked out of place but that didn’t match Bandli’s description. We left empty-handed but hopeful that somewhere in this no-man’s-land lies a trove of otherworldly fragments, waiting to be discovered.